As a dad, I’m a big fan of simplicity so a two-stroke is perfect for a kid’s bike. Just chuck it in the shed, and when gets hard to start, rebuild it with some spare change and away she’ll go for a few more years. And who doesn’t like the smell of burning two-stoke oil in the morning? So why would anyone buy an electric bike when perfection already exists? Some parents are just not motorbike people. Noise, blue smoke, Jerry cans, oil bottles everywhere, chain lube, air filters, spanners, rags, tie downs, riding gear ̶ the list goes on. Then there are dads who have a shed full of bikes but they don’t want another one to maintain. Soccer or ballet never seemed so awesome. Electric bikes have a few tricks up their volt holes and are chipping away at the excuses for parents not to buy a motorbike. 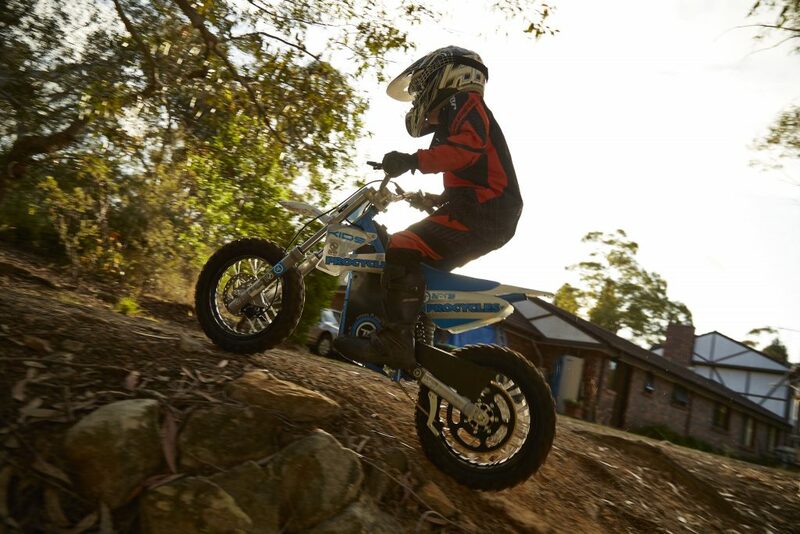 I bought my youngest son Marcello an electric trials bike when he was three-years-old, which he loved, but he struggled with its aggressive power delivery. 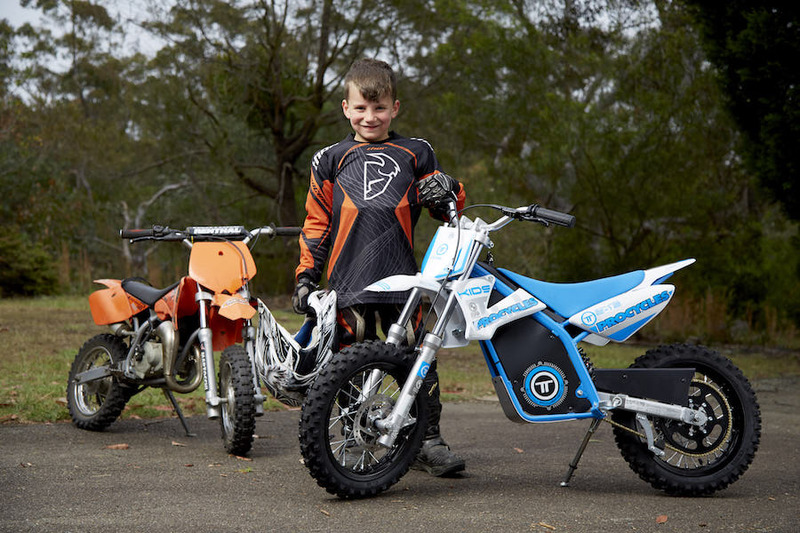 He is now six and loving his noisy and smoky KTM 50, so I was very keen to see how electric technology had progressed and if a kid could love a bike without a cool exhaust note. In the showroom it looked great. Proper heavy-duty wheels and tyres, the fork looked strong, and the fake radiator shrouds were essential for mounting all the stickers that kids accumulate. 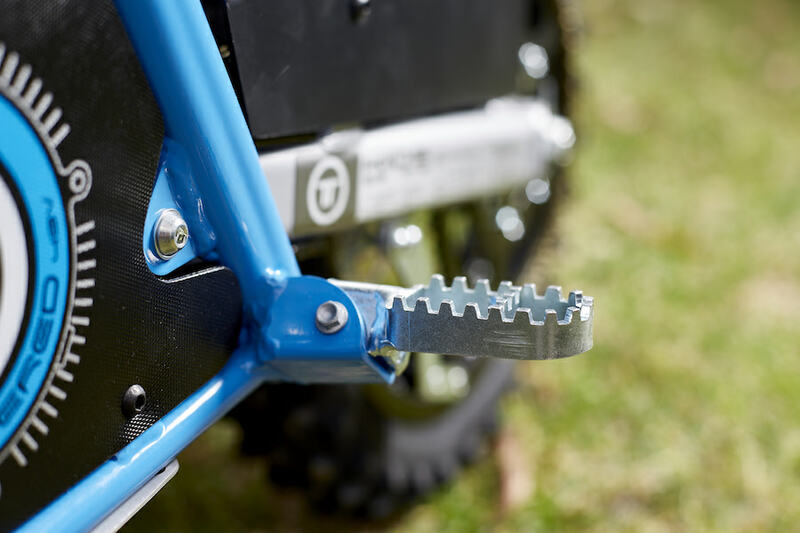 The rear shock looked a bit too mountain-bike to do the job, and the chain and sprockets looked very lightweight and would need to be kept perfectly tensioned to stop the chain slipping on the front sprocket. I wheeled it out of Procycles’ showroom and put it on its side in the back of my car, no fluids, no leaks. Brilliant. I skipped getting fresh fuel from the servo because I had plenty at home lurking behind some power points. My son was geared up and ready to go when I pulled into the driveway. He fitted the bike well, and with the adjustable levers set as close to the ‘bars as possible, he was off with the sneaky switch set to 50 per cent power. Kids are smart and Marcello soon sussed out the switch and used it on 50 per cent power for tricky slow speed obstacles and dad’s figure eight tests where feathering the throttle at 100 per cent was too difficult. After a few days of riding I never got used to not knowing where the bike was. With a two-stroke you know where the bike is with its familiar ‘neeeh’, ‘neeeh’, ‘neeeh.’ Electric bikes could do with an alarm system or something that says ‘Dad, I’ve crashed! !’ We live on five acres and bike noise isn’t a problem. That’s until you’ve tried no noise. But then I can’t believe how good it is to just call out and be heard. No more yelling or throat cutting signals to turn the bike off. Oh and warming up a two-stroke is a drag when an electric bike just whirrs off immediately. Having said all that electric bikes aren’t really noise free. The chain lashes and the motor emits some noise, and it isn’t nice. I’m sure a petrol bike gives off the same rotational mechanical noise, it’s just disguised. Marcello was bike swapping constantly during the test, and some interesting things emerged. He was much smoother on the throttle on the Torrot whereas on the KTM he constantly blipped. Acceleration was much better on the Torrot. The initial burst of electric power was not the crazy burst like his previous electric bike. The KTM bogged down off the start by comparison, and it has recently been rebuilt. A big plus for electric is that the tuning is done just once and doesn’t change with wear and tear. I set up an unscientific timed drag strip over 30m, starting the stopwatch once the throttle was wound on. The KTM’s top speed is faster but on average it was nearly a second slower over the distance, in part due to the hesitation off idle like most petrol-powered bikes. 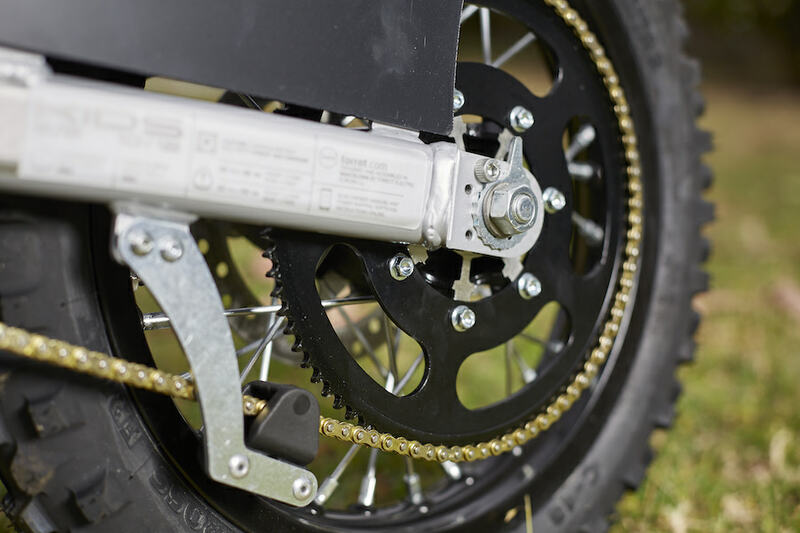 The brake test was done at the end of the drag strip, and the Torrot’s double hydraulic discs were amazing compared to the drum-braked and admittedly old KTM 50. The Torrot had excellent stopping power and feel. Marcello was confident enough to grab a handful of brake and release when the front slid on loose surfaces. The suspension worked well. It was sprung on the heavy side but not so heavy that adults can poke around on it like some kids’ bikes. I got Marcello to hit some big rocks pretty hard, and even he rode down some stairs; it soaked the bumps and didn’t bottom out. 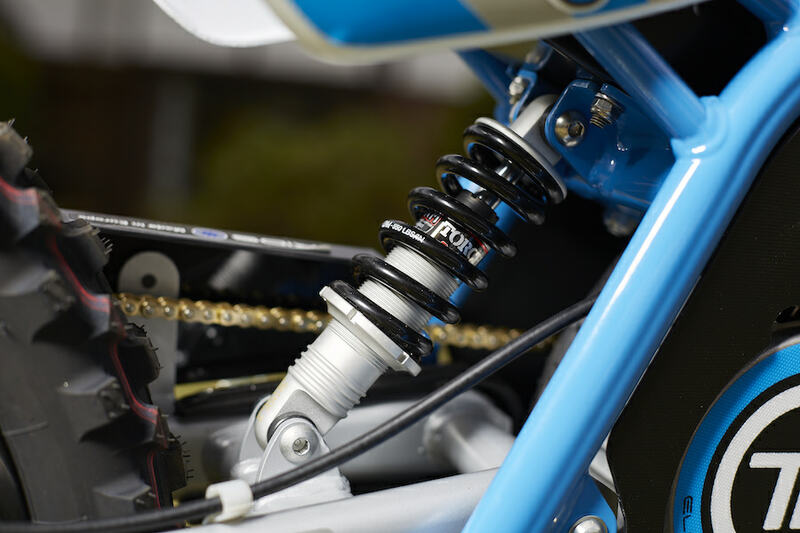 The stiff suspension help pop wheelies off roots and rocks. He loved that. Even with five acres I would definitely consider an electric bike. 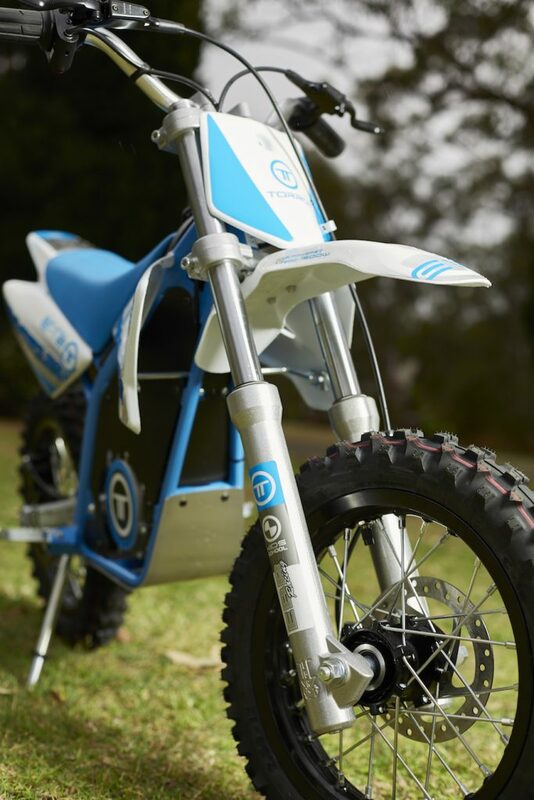 The Torrot looks great to the kids that I showed, and they don’t have the internal combustion bias that a lot of riders have. It is an ideal choice for time poor and mechanically challenged parents, as kids can re-charge the bike and get going by themselves. – Easy to forget there is still maintenance.